While exploring the Lionel Robbins Papers for LSE Library, Kathryn Hannan found evidence of a short-lived dispute lost to history, which took her to the Beaver archives in LSE’s Digital Library. 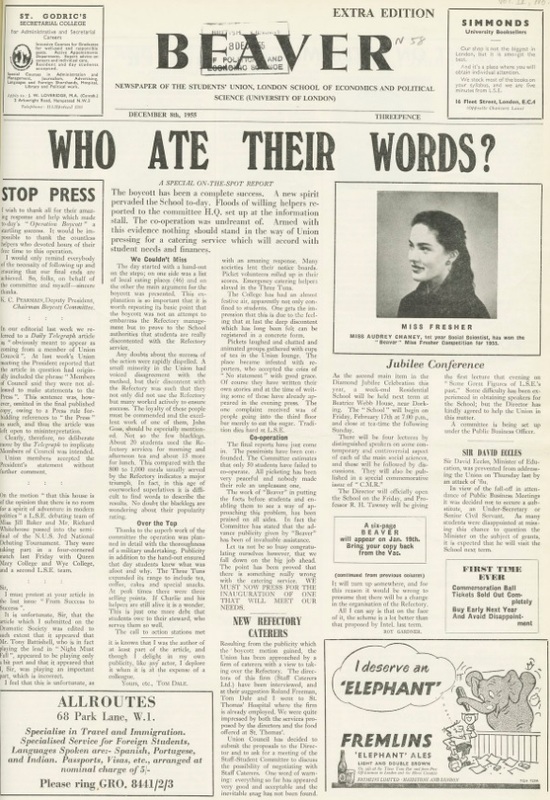 A complaint about campus food prices in October 1955 had resulted in a one-day boycott of the refectory and a motion put forward by the Students’ Union for a new catering company to take over the contract. 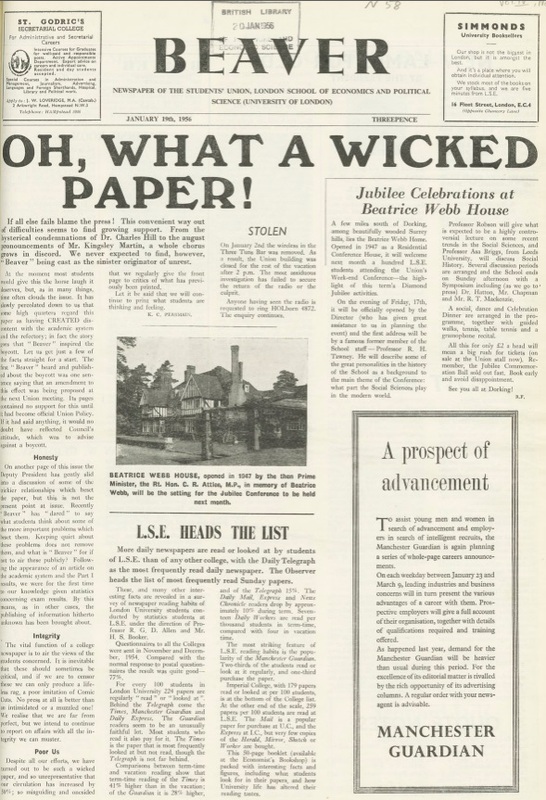 The Lionel Robbins Papers discuss the “Troubles” at LSE in the late 1960s but I was perplexed to come across reference to a dispute with students in 1955. The first mention of these 1955 troubles was in the following letter from Lionel Robbins to L Barnett (Clare Market Review/LSE Student Union) (collection reference ROBBINS/TEMP/116). Lionel Robbins declines an invitation from Barnett to contribute an article to the Clare Market Review, using quite strong language. 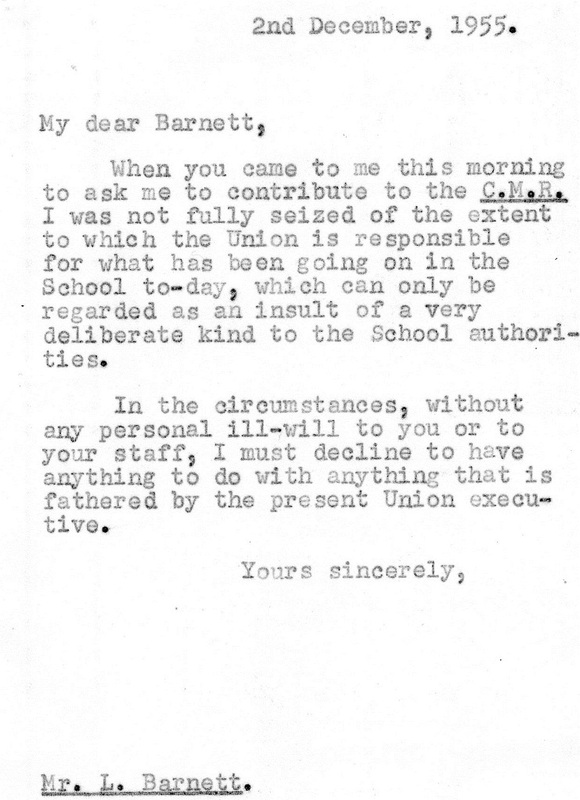 Lionel Robbins’ wording “an insult of a very deliberate kind to the School authorities” and “I must decline to have anything to do with anything fathered by the present Union executive” suggested some kind of confrontation not really associated with the mid-1950s. As the invitation came from the Students’ Union I thought the digitised copies of The Beaver in LSE Digital Library might be able to help. 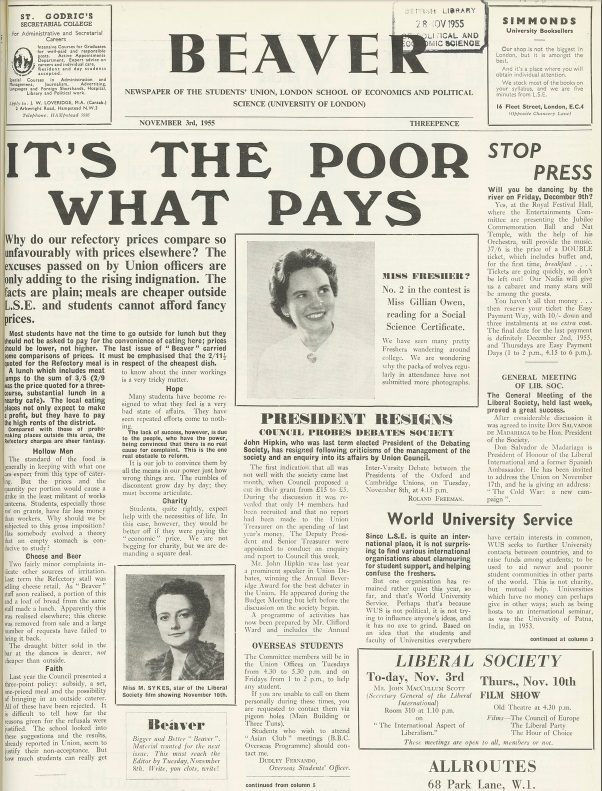 The “trouble” was front page news from 3 November 1955 through to 19 January 1956, with the first front page article on 3 November “It’s the poor what pays”. The entire dispute is over the price of food in the refectory, first mentioned on 20 October. On 17 November the Refectory Committee responds to the complaints in a second front page article, disputing some of the prices previously quoted in The Beaver and suggesting that students fill in a survey to make their views known and contribute to any possible changes. This didn’t satisfy the Students’ Union. 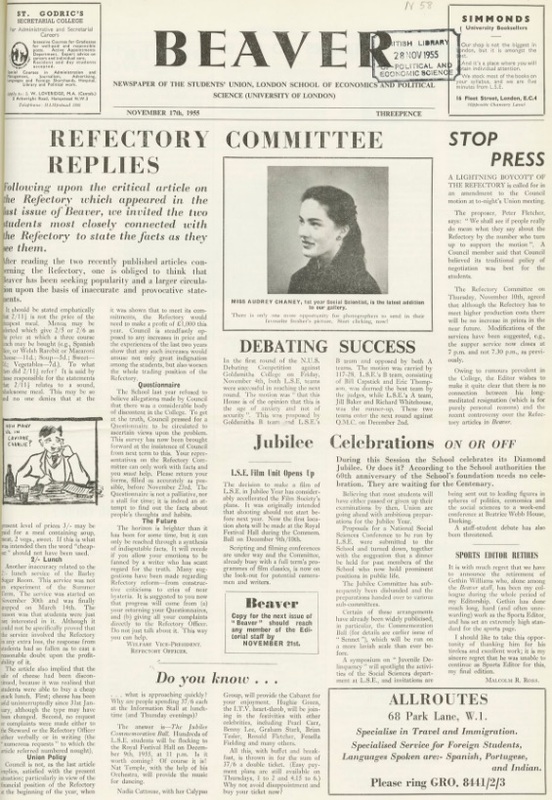 They called for a boycott of the Refectory which was announced in the 1 December issue. 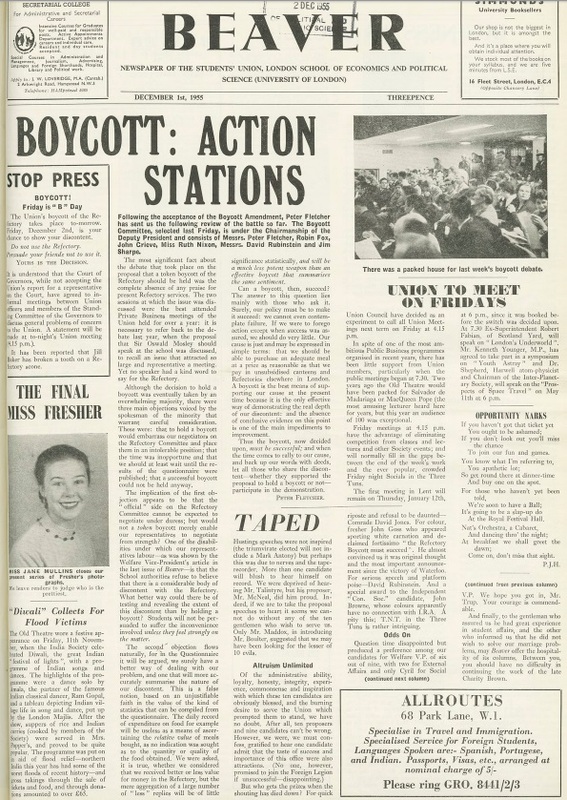 A description of the boycott appears on 8 December 1955. It reports that the boycott has been a success as around 20 students used the Refectory for morning and afternoon tea and 15 extra for lunch, compared to the usual 800-1,000 meals served a day. It also reports that the Union have been approached by an alternative catering company. It rumbled on through to the start of term in January 1956 but after that it seems to have died down again. You can read more about the dispute in the online issues of The Beaver. 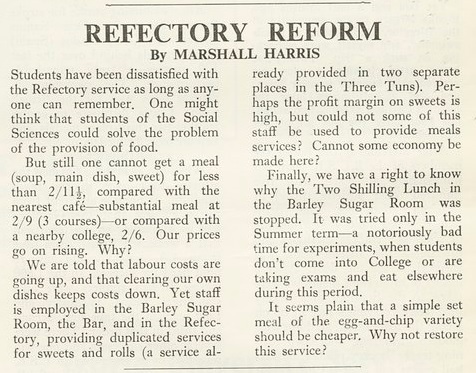 When LSE was making headlines for the “Troubles” Lionel Robbins must have wished the problem was as simple as a complaint over food prices in the refectory! Contributed by Kathryn Hannan (formerly of LSE Library). This post originally appeared on the LSE Library blog.